A collection of blogs and other sources about local issues. These aren’t “ours” (that is, they aren’t run by the Democratic Committee, although some of the bloggers do happen to be members). But, it’s nice to have a collection of local viewpoints… especially ones that we’re typically sympathetic to! Lee Becker blogs at Oconee Observations, and aims that as a newsletter. He features video recordings of most governmental meetings and political events. 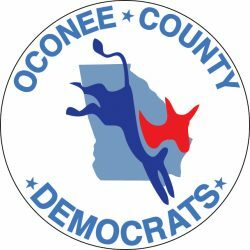 Dan Matthews blogs as Oconee Democrat; Dan has been pretty active with both political and “lifestyle” local news items. Freeland Abbott occasionally muses as Left of Center; he’s not particularly frequent, and hasn’t been at it as long. While they are not specific to Oconee County, if you’re a newcomer to the area, you’ll also want to check out several Athens-based publications: Flagpole, UGA’s Red and Black, and the Athens-Banner Herald. You’ll also find news and information programming offered on our public radio affiliate, WUGA, with local news programming including Athens News Matters, and state-level political news on Political Rewind. Additionally, you can get excellent state & local political and community commentary on WXAG, 92.7 FM and 1470 AM. Former District 117 State House Rep. Deborah Gonzalez hosts Open Records live on Sunday nights. Listen to podcasts of previous episodes at https://openrecords.podbean.com. Community Forum with Rick Dunn, Thursdays 4-5. If you have additional suggestions to mention on our website, please drop us a line to let us know!